Many software are available to achieve windows drivers update or PC driver update automatically. I found few free driver update software which automatically scan, download and update my drivers easily. Every PC has many driver software and it is required to keep it up-to date to make keep your computer optimized ( Top 10 ways/ tips to speed up your computer – Best PC speed up Tips) . If you do not have proper driver software then PC will be slower and more likely to crash, or will have problems connecting with peripherals. Manually updating all your driver software is a time consuming as well as tedious task. Today we analyze some free software that will do this job for you. These software applications will scan your computer and check its version status and will download and install the updates automatically. This way you can make sure that your PC drivers are up-to date. Often device drivers can become outdated or corrupted leading to inconsistent system performance ,slow speeds or causing your hardware like printer, scanner etc. to stop working. DriverScanner scans the system and will identify outdated or corrupted drivers and will prepare a report to analyze. Then you can use the update drivers option to update the outdated drivers. See a sample device driver report below. The DriverScanner also suggest you whether it is safe to update the driver or not. The software also provides a driver download history. The software also creates a restore point every time a new driver is installed. In case of any issues you can easily restore your system state to the previous one. You can also set the directory for the downloaded driver file by selecting the folder in the Settings menu. 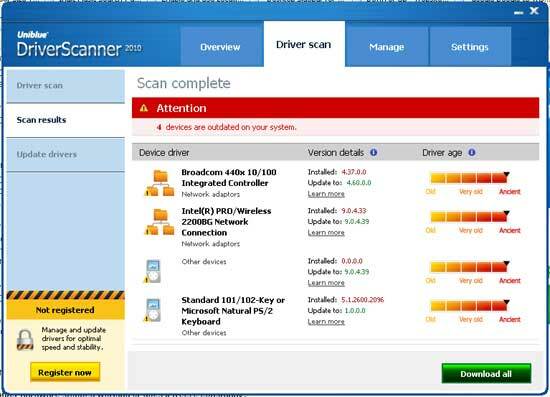 DriverScanner detect and checks drivers specific to your PC. You can also set the options like to launch DriverScanner when windows starts or to start a scan automatically when DriverScanner is launched. Windows 2000 in 32 bit or 64 bit Editions. This is a Freeware Windows Driver Updater.Device Doctor scans your computer hardware and checks to see if there are new driver updates available for your devices. We have already discussed Device Doctor and read more about Device Doctor here. DriverEasy is a good tool to detect and download missing or outdated drivers. Driver Easy will auto-detect your computer hardware and will find out all drivers & updates. We have already discussed DriverEasy and read more about DriverEasy here.